The first draft of my next novel and sequel to Thumb, Ragged Claws, is now finished and tucked safely in a drawer for a month. It’s hard not to keep re-reading and tinkering, but I know from experience that if you’re not careful you end up reading what’s in your head, not what’s in the manuscript itself. So to keep myself occupied I’m spending the next few weeks creating the artwork and for that I’ll be using the 3D animation software Houdini 13, which was released last week. Normally a full licence for this would cost anywhere up to $9,000. That’s if you are one of the big studios who uses it for movies like Thor: The Dark World or Gravity. For people like me there’s the ‘starving artist’ edition which is a mere $99, which is incredible really because it’s no different to the full version. The only difference is if you use this on your Hollywood blockbuster, SideFX’s lawyers will pull your toenails out. Many many years ago (1974) BBC 2 did a series called ‘The Do-it Yourself Film Animation Show‘ which showed people how to make their own cartoons, with the help of famous animators like Terry Gilliam of Monty Python, and Bob Godfrey who was responsible for the hysterical he’s-eaten-too-many-jelly-tots cartoon Roobarb. In those days the technology stretched to cut out bits of paper, felt pen and biro (which gave Roobarb it’s unmistakeable psychedelic vibe) and for the really ambitious, acrylic paint on acetate (Disney). I built myself a rostrum with bits of wood and paint cans, bought a second hand ex-Wermacht (probably) Standard 8 cine camera and made a few films. It was great and I fell in love with animation. 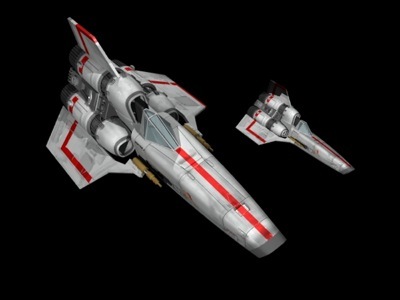 A couple of Vipers I built using the 3D package Lightwave. I saw Tron in 1982 and like every other geek on the planet my jaw hit the floor with a loud clang. Even though the actual animation in the film is under 20 minutes, the potential it had for creating entirely believable fantasy and science fiction worlds captured my imagination. Over the next thirty years I tinkered on and off with different 3D computer packages, creating landscapes in Bryce 3D with its ground-breaking terrain generators, and learning how to build Battlestar Galactica Vipers in Lightwave which, for a short while, was the program of choice for budding 3D animators. The special effects in Babylon 5 and the rebooted Battlestar Galactica were both done in Lightwave. There are essentially three levels of 3D software for those interested in having a go. At the bottom end Daz3D and Poser are used by many to populate Uncanny Valley with thousands of unfeasibly-breasted fantasy mannequins. These programs operate a bit like an Action Man or Barbie set – get a standard human figure, pull it about a bit to turn it into a character, dress it up and plonk it in a pre-designed landscape. Bingo, Thongar the Barbarian rescues Princess Mammaria from a giant Steampunk Robot. You can actually get very good results if you put in the time and effort, though it’s pretty easy to spot artwork from this end of the spectrum because of the doll-like sameness of a lot of the images (and the slightly, er, adolescent subject matter). There’s not as much available mid-level any more, although the wonderful free program Blender is still around. This is because 3D animation has now reached such a level of sophistication that in order to achieve the quality expected by most production houses you have to go for one of the high end professional packages. In the past these cost an arm and a leg. A lot of companies realised that this was counterproductive if they wanted to make sure that each new generation of artists were adequately skilled in their software. So they started making student editions available, which is great news for the rest of us who baulk at stumping up $9000 a licence. The professional 3D animation world is dominated by Autodesk’s Maya, and Houdini, which is odd because you will very rarely hear about the latter in 3D forums, despite being used on just about every major movie. Opening credits to Skyfall? Big splashy whale in Life of Pi? All done in Houdini. The problem is that the software uses a completely different paradigm to all the other packages, which makes it both incredibly powerful but also a bit of a challenge to learn. Once the penny drops, though, it’s fantastic to work with. At the moment I’m working on the back cover for the book. Without giving too much away I wanted to show some strange vehicles making their way over a weird blocky landscape in an empty universe. As I mentioned before, the overall aesthetic I wanted to aim for was somewhere between the art of the German Expressionists, and the very early SF covers of the 1930s, especially those of Frank R. Paul and Wesso. I didn’t want to make it look like a super realistic vision of the future – partly because I see too much of that in movies, and partly because it takes huge teams of software engineers months to make it look good. 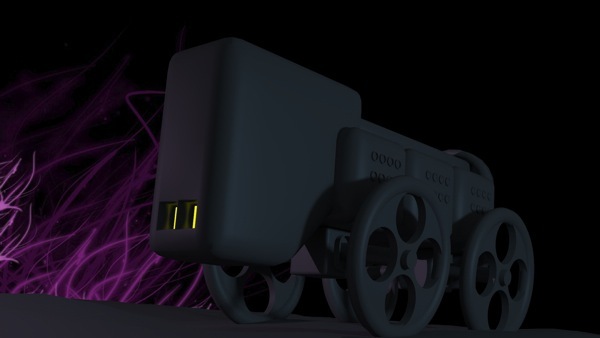 Test render of the strange Expressionist caravan. So here is the strange vehicle. It had to look sinister, and slightly distorted, like a child’s toy that’s gone a bit grotesquely mad. Without going into too much technical detail, Houdini uses a procedural system that allows you to work at any stage of a model build so you can revisit earlier parts and make fundamental changes without impacting on the details you add later. In this case I decided to fatten up the wheels and angle them a bit more, to make them look reminiscent of a bug’s legs. 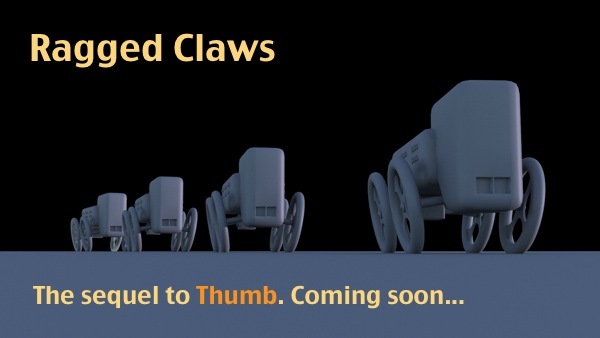 An early test render for the mysterious vehicles. The next thing I wanted to create was the landscape. It’s the skin of a man-made mannequin five hundred thousand miles long, built from debris and scrap brought from the distant past. Up close it’s a wilderness of blocks, shapes and lights flung together. 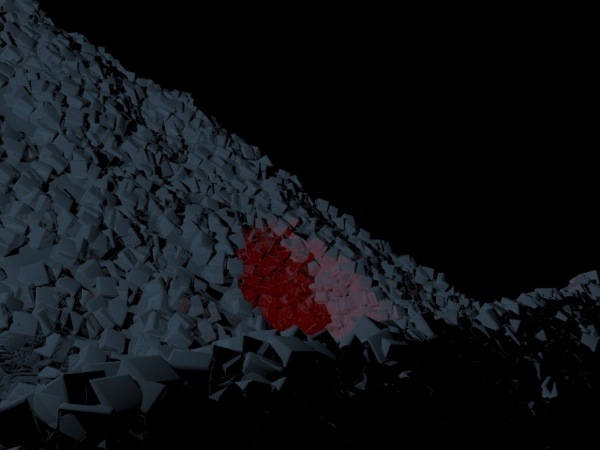 I’ve built a routine in Houdini that allows me to randomly generate huge swathes of this landscape. 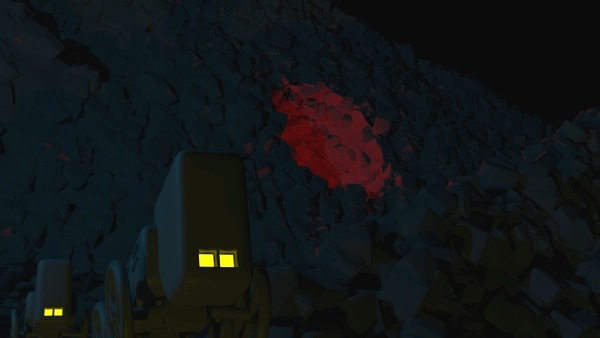 Here’s an initial render of the landscape to allow me to check the geometry of the scene. Test render of the surface of the titan’s skin. High above the atmosphere. At this point it’s worth stating the number 1 Golden Rule of 3D. It’s also the bit that’s often ignored. After spending months building, rigging and texturing a model a lot of artists just bung in a couple of lights and end up with the kind of unmotivated and flat illumination that plagues many 3D images. Obviously with the scene set in the eternal night at the end of the universe I’ve got to get the balance right between showing a landscape plunged into darkness, lit here and there with a few guttering lamps or mystic light sources, and making sure enough of the scene is visible and recognisable. Here’s a draft of the final image, with the vehicles added to the landscape. The whole thing needs a lot more work, but as a first pass I’m quite happy with the results. I love the artwork. Its rare, if not unheard of for me, that a simple cover design captures the feel of the novel so well. I leave the Moomin books out of this naturally. The images for Thumb were perfect: the style, the colour tones, the slightly skew-wiff house, the airfix glider. Made the world so easy to imagine. These images will work the same way I’m sure, dark, unsettling in the same way toys coming to life is slightly disturbing. The insect wheels give the trucks a vaguely jokey feel, again like plastic toys with sinister intent. Very well done.